Why must the Supreme Court of India on January 19 declare Article 35A illegal and unconstitutional rejecting outright the suggestion of the J&K Government that hearing on it should be deferred as J&K is under the President’s Rule? The next hearing on Article 35A is slated on January 19. It is an illegal, unconstitutional and divisive provision. It was the brainchild of Prime Minister JL Nehru and radical Islamist in Kashmir. The whole objective behind this unconstitutional act was to help Kashmiri Muslims establish Islamic Republic of J&K on the soil of Bharat. The worst part of the whole situation was that the then President of India, Rajendra Prasad, who was constitutionally bound to uphold the Indian Constitution and protect and promote further the country’s sovereign interests, also became a party to the conspiracy hatched by Nehru and his Islamist friends in Kashmir. Article 35A virtually gave a sovereign status to J&K in the sense that it empowered the state government to grant or to not grant citizenship rights to an individual or a group of individuals not residents of J&K before May 14, 1944, despite the fact that J&K acceded to Bharat on October 26, 1947; that J&K was a princely state and that India had not attained freedom from the UK. That the Nehru Government applied this obnoxious Article to J&K with retrospective effect to a state which was not then constitutionally a part of the political and constitutional organization of Bharat must make all its well-wishers and friends sit up and expose in one voice what the Nehru Government did to the nation to please the votaries of the two-nation theory. Article 35A, along with Article 370 of the Indian Constitution under which the solitary State of J&K enjoys a special status, have a separate constitution and separate flag and exercises residuary powers, has only promoted politics of separatism, based on religious fanaticism, in Kashmir and helped Islamists convert Kashmir into 100% Muslim and change Ladakh’s and Jammu’s demography to the extent that their very identity and personality is under grave threat. It may appear unbelievable, but it is a fact that Kashmiri Muslim rulers have granted citizenship rights to thousands of Muslims from China and Tibet in the Valley. In 1952, the then J&K Wazir-e-Azam Sheikh Abdullah granted citizenship rights to many Uyghur Muslims from the Xinjiang province of China and settled them in Srinagar’s Jamia Masjid area. Uyghur Muslims had migrated to Kashmir to escape the wrath of Communist China. Similarly, in 1959, Sheikh Abdullah’s successor, Bakshi Ghulam Mohammad, granted citizenship to many Tibetan Muslims. He, like his predecessor, also settled his co-religionists in the same area. The denial of citizenship rights to Hindu-Sikh refugees from Pakistan and members of the Valmiki Samaj and grant of citizenship to Uyghur Muslims and Tibetan Muslims only indicate the nature of the communal outlook of the Kashmiri Muslim rulers. It’s a matter of regret that New Delhi did nothing whatsoever during all these years to get Article 35A repealed to establish parity between the people of J&K and the rest of the country. Worse still, our law-makers in the Parliament allowed the unconstitutional Article 35A to play havoc with the nation for so many decades for reasons best known to them. The nation had pinned faith in the BJP given the fact that it all along talked about “one nation and one law” and advocated the need for complete integration of J&K into India, but it also failed. Its stand on the issue in the Supreme Court has been utterly uninspiring. 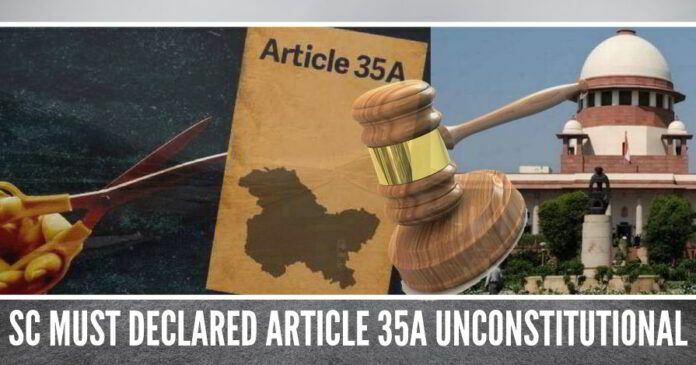 The truth is that the BJP Government has not filed any affidavit till date in the apex court indicating its stand on Article 35A. The Supreme Court would do well to rise to the occasion and interpret the Preamble of the Indian Constitution and Articles 14 and 16 of the Constitution as they are and strike down not just illegal, unconstitutional and divisive Article 35A, but also Article 370. It has to because it is its fundamental duty to protect the basic structure of the constitution. Its really heart rending to see our brethren and natural citizens of Bharat – Hindus, are NOT recognised as Citizens, reduced to the state of REFUGEES in their own Motherland, thrown out of their hearth and homes, despite complying with all legal requirements for a Natural Citizen. Even the illegal immigrants from Rohingyas from Myanmar & Bangaleshis are enjoying more rights and privileges than the Hindus. Womaniser Jawaharlal Nehru was the sole culprit for this pathetic situation of Hindus today. If BJP Govt can’t remedy the situation by initiating suitable remedial measure [ i.e. Removal of illegal insertion of Art 35A & 370 in Indian Constitution ] through Order approved by the President of India now, it can NEVER do it later. I wish I am proved wrong as far as BJP Govt is concerned. Shri Narendra Modiji led BJP/NDA Govt wasted & squandered away people’s mandate for the last 4 1/2 yrs and I do NOT know whether they have the political will, stamina & noble intention to remedy the situation in J&K atleast in the remainder of term, within 4 months. I can only tell our PM Narendra Modiji NOW OR NEVER. SC will just postpone the decision….it cannot decide anything which hurts (though legally correct) minorities. Can this govt bite the bullet?